St Louis Airport (STL) is one of the most historic airports in the United States. It was at Lambert-St Louis International Airport (STL) that Theodore Roosevelt became the first American President to take a plane flight. The field was also the location of the world's first parachute jump. Developed in 1920 by Major Lambert, the airbase at Kinloch Field became the first municipal airport in the United States in 1928. A beautiful mural documenting the history of U.S. aviation is on display in the Main Terminal along with Col. Charles Lindbergh's personal Monocoupe plane, which hangs over the terminal's lower level. Lambert-St Louis airport is located 13 miles (21 km) from St Louis and offers convenient transport links to the city via the light rail system, amongst a range of transport options. The airport has two terminals serving over 30 million passengers a year, making it the 11th busiest in the USA. Facilities include a selection of shops and dining outlets, though it does not provide duty-free shopping. 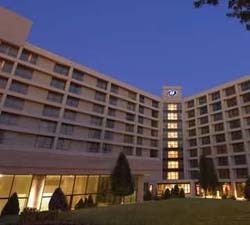 St Louis World Airport Guide provides you with access to a complete selection of St Louis airport hotels. Utilize the discounts offered directly from the hotel, with the assurance of secure booking. Extra services include airport car rental, airport car parking and flights to and from St Louis airport. Please note: The term Lambert-St. Louis International Airport STL as well as all associated graphics, logos, and/or other trademarks, tradenames or copyrights are the property of the St Louis Airport authority and are used herein for factual descriptive purposes only. We are in no way associated with or authorized by the St Louis Airport authority and neither that entity nor any of its affiliates have licensed or endorsed us.